SET OF 4 TRANSPARENT FLY TRAPS that use NO Poison. Instead they catch flies with a sticky surface. Once insects touch the trap, they can never escape. Very effective for catching house flies, spiders, gnats, moths, and any other flying or crawling insect. To apply simply remove the backing and stick to window in the corner or lower portion. This is where flies and other insects land. Then sit back and watch as your trap fills up with flies. When full, simply peel the trap film from the window and place in the trash. It's clean, simple, and very effective at ridding your home or business of bothersome flies. SAFER FOR PEOPLE, CHILDREN, PETS thanks to using NO poison, insecticide, or harsh chemical of any kind. This is much better for catching insects around children, those with asthma, people with allergies, or with sensitivity to perfumes and insecticide poison. This has no odor and does not fill the air with fumes or chemicals. GREAT FOR ALL SEASONS during the year and especially appropriate for summer fly season. Don't let your kitchen, bedroom, or bathroom fill with unsanitary flies. They spread disease, bacteria, and germs. How many times has food been made unappetizing after flies landed on it? You save money and time by using these modern eco-friendly fly traps. 100% MONEY BACK GUARANTEE ensures this will be your best bet for a pleasing no-risk purchase. Many customers love these 4 fly traps so much they return to buy 2 or 3 more sets. HURRY AND BUY NOW while we have fresh supply in stock. 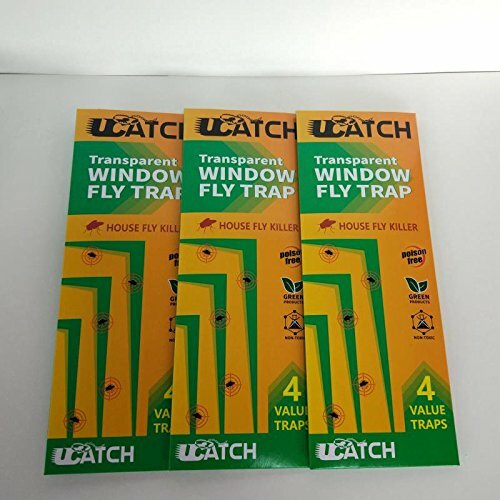 These make a much appreciated gift for friends, family, and co-workers - anyone who wants to kill flies without using poison. * CATCHES FLIES WITH NO POISON. 100% safe for family, children, animals, and plants. No toxic poison fumes or need to wipe down surfaces. This catches flies and other flying insects for days until it is full. * PLACE IN CORNER OF WINDOW or along the bottom of a window. This is where flies, gnats, moths, and spiders usually land. Once they touch the fly trap, they are stuck for good. Stop all that swatting and use these super convenient fly traps. * EASY TO USE simply peel off the glue tape and stick to a window glass. When the trap fills with bugs, just peel back and throw away. Will not leave unsightly residue on your window. Clear film trap lets you see through window. * STOP UNSANITARY FLIES that can carry disease, bacteria, and germs. This fly trap stops flies from getting on food, eating surfaces, and children. No more irritating buzzing around your head when you're trying to work, watch TV, or read. Great for both homes and business. * 100% MONEY BACK GUARANTEE ensures this will quickly become your favorite no-risk purchase. Many people are stocking up with several sets of this modern no poison fly trap to keep their home or business fly free to months. HURRY AND BUY NOW while we have this popular green pest control product in plentiful supply. This makes a thoughtful birthday gift or holiday present for anyone who wants a better way to get rid of pesky bugs! If you have any questions about this product by UCatch, contact us by completing and submitting the form below. If you are looking for a specif part number, please include it with your message.